In a strange and morbid way, Echo Productions has exceptional timing. 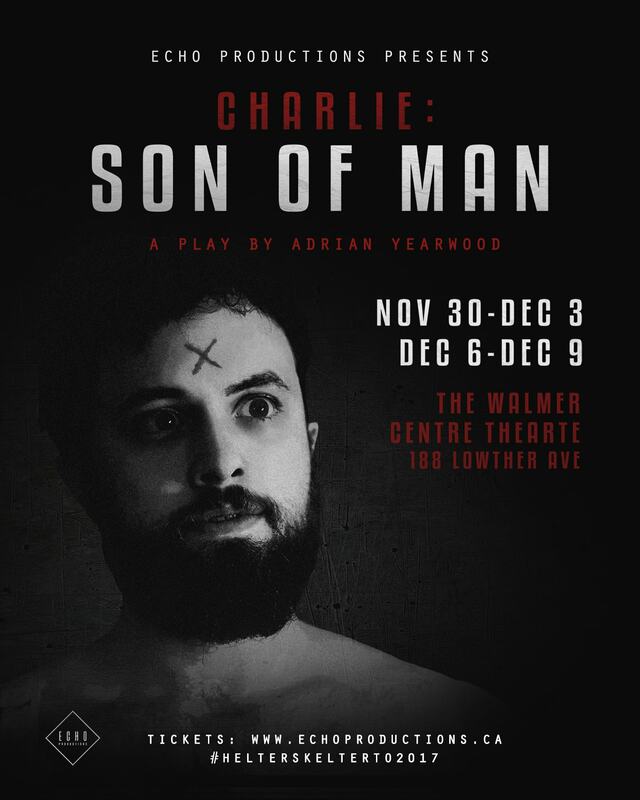 Their debut of Charlie: Son of Man, a theatre production about the murders orchestrated by Charlie Manson, opened just two weeks after the icon died in prison. It is inconceivable that Echo Productions could have planned this but their play was perfectly timed for a revitalization of the Manson conversation. The Manson story is well-known. Ex-convict Charlie Manson formed “The Family”, a cult, and organized- yet didn’t himself commit- seven murders. He prayed on vulnerable young people, providing them with love and then manipulating them to do his biding. The Echo Productions interpretation keeps the storyline as it happened but twists it by replacing the drug culture with social media culture. The intent of this change was to make the story more accessible to this generation. On one hand, it works really well. Hashtags are projected onto a screen, summarizing the scene events and adding subtext. For a show that’s so dark, it provides necessary comedic value. But on the other hand, nothing else in the storyline is changed to accommodate the modern insertion of cell phones and social media. The play floats in time, not completely committing to the 60s or the now. The story moves between the events surrounding the horrific murders and Manson’s trial. The juxtaposition shows the characters under Manson’s control and the calculated environment of a court house. Chaos and order. The contrast is smart, giving the audience multiple perspectives on what happened and making a difficult story easier to digest while keeping the authenticity of the situation. It is easier for the audience but harder for the actors. The performers move their characters between environments with dexterity and rise to an impossible task: realistically portraying crazy. And they do it exceptionally well, particularly Courtney Lamanna as Susan Atkins. Lamanna caused my stomach to crawl up my throat in disgust. In any other play, this may not be an indicator of success but the tragic and disturbing subject matter makes it a bullseye in this case. James Karfilis as Charlie Manson is also excellent, his madness pure and unfettered. The only issue with the Manson character is in the text and direction more than the performance. Manson was a manipulator and took advantage of at-risk youth but the show only talks about his magnetic traits and doesn’t show them. And then there is the dancing. Sometimes turbulent, like the helter-skelter they were exploring, sometimes in impeccable unison, the dancing embodies the group mentality and Manson’s control. I hadn’t anticipated the dancing to bring so much character and gloom to a piece. This wouldn’t have been possible without Kyle Duffin, musical director. Just one guy with his guitar playing songs from The Beatles transformed the theatre into the world of Manson’s delusion. This is an unexpected triumph for Echo Productions. They skillfully, delicately and successfully deal with a contentious story and take the audience down a rabbit hole. I was sitting on the edge of my seat through Charlie: Son of Man, wanting more and yet questioning if I had the capacity to keep watching.